« Which Used Cars Are Trending Demand Exceeds Supply? Getting traffic to your dealership’s site is good, but converting that traffic into customer action is even better… Plus a Google Bonus! Time is money, right? In this case, time is conversion. You don’t want people waiting for your site to load (after all, they are here by choice and not because they have to). So, trust me when I say that they will run to the hills when a site is taking more than a few seconds to load. If they feel like they’re losing their time, you lose your conversions, so make sure to have your website speed optimised. This one is a no-brainer, right? Big buttons (as in tastefully big and not disproportionate to the rest of the design) are the hack that will help you push the right buttons of your visitors. Note that they must be buttons – not a text, not a link, not a zipper, but one big fat button that shows exactly what you want your visitors to do next. Content should be simple, e.g. Request Test Drive, Place Deposit, Reserve This Vehicle, Sign up Now, Get Approved, Read More Here, etc. Feel free to play with the language and maybe make it funny or more casual, e.g. Just Do It, Hit Me, Make My Day, Don’t Tell My Wife/Husband and so on, but always remember that less is more. Also keep in mind to use a clean, readable font; this applies to the whole site and the buttons themselves. You don’t want the ‘Oh, what does this button do?’ kind of situation. You need to provide strong and catchy headlines to grab people’s attention. Again, remember to use simple language and clean fonts. As catchy as it may be, your headline should be very specific. Your website visitors have to be able to know without a shade of doubt what they’re getting into. You will also need more detailed descriptions of the vehicles and services you’re offering. The description should be brief (time is conversion, remember?!) and contain the most relevant information. Do point out what makes your dealership special, but remember not to sound like a braggart. Try to incorporate action-based verbs, and, again, keep the language simple and the font clean. Also, include only relevant information in your descriptions. This marketing technique is an oldie but a goodie. Plus, generosity is always appreciated. Web-based stores have loads of different options for providing free stuff for their customers. Examples include: offering free delivery to home or workplace, free overnight test drive, buy-1 new Raptor-get-1-free Fiesta, etc. – you know what we mean. Try creating a display case near your showroom with low cost, but branded gifts. Offer your website visitors their choice of a gift from the display case if they request a showroom appointment and then show up. Get your website visitors hyped for buying your vehicle, accessories or service. How? By notifying them about any discounts you currently have going on. Also, you could provoke them to Buy Now! by letting them know that the vehicle model on sale you’re offering is low in stock. Or, they should Grab one before it’s gone because there are Only two left! Prove to your website visitors that buying from you will be the right decision by featuring reviews and testimonials from other customers. Don’t overdo this either and don’t make it the most prominent part of your website. It should act as further, yet subtle motivation for people to take the desired action on your site. Give your website visitors a sense of security by providing detailed vehicle warranty information as well as a link to your 3 day used car return policy. Make sure that all terms and conditions featured in both the guarantee and the return policy are clearly stated and written in a clear and simple language. Let your website visitors reserve a new or used vehicle for a limited amount of time by making a deposit. Deposit refunds, should they change their mind are available when they visit the dealership with valid government issued ID. Provide multiple payment options for your website visitors to make their experience even more comfortable and remember to feature that information on Vehicle Detail Pages (VDP). Show your purchase deposit and payment options as icons in a nice bright place on your front page. Accepting Gold Coins and Bars for payment is always a nice touch. Comply a list of the Frequently Asked Questions related to your vehicles for sale, accessories or service department. After all, you know best what you offer for sale, so make sure to answer all uncertainties that may possibly arise. You can place that list on a designated page or feature some on the front page – it all depends on how F your FAQs are. If you want your website visitors to fill out lead and other forms, make sure that there are only a few required fields. That brings us back to time is conversion, as you don’t want to lose conversion by wasting your visitors’ time for filling out forms. Keep only the necessary fields mandatory and make all the rest optional to be filled-in by those who feel like it. The vehicle details page (VDP) is a competitive asset that drives consumers to the lot. But like all assets, VDPs require care and feeding to bear fruit. In the age of Instagram and YouTube, your VDP needs to feature striking visuals (not boring stock photos) and video. The texting generation also wants snappy, well-written content that sells the vehicle instead of listing features like a catalog. In addition, by necessity, dealers must provide more transparency and detail to communicate the value of the product, especially as automobiles become more sophisticated. Consumers want to learn more about the product – from you and from each other. Our own research shows that about eight out of 10 shoppers rely on online reviews to purchase a car. VDPs are so important that Cars.com recently added Salesperson Connect to our VDPs, which means Cars.com VDPs now highlight the product, price, place, and person. As a result, we can keep consumers engaged, build trust between them and your dealership, and facilitate a quicker and more personalized path to purchase. There you have them – I promised you 11, then over-delivered a total of more than 14 conversion rate optimization hacks that will make your dealership website conversions grow like crazy. Long story short: keep your site clean from cluttering and unnecessary data, remember that real and original is more when it comes to descriptions, photos, etc., and keep things as simple and as fast as possible. Every AdWords advertiser’s ulterior motive is to gain relevant prospects via clicks on his ads. If you are an advertiser yourself, this scenario will definitely sound familiar. Well, this sets our goal – try and achieve as many clicks on your ads as possible. Now, what if we say that you can achieve your motive quickly and efficiently through an innovative tool called AdWords extensions? Yes, There are a number of AdWords extensions available today that can increase the number of related clicks on your ads drastically. They help you convert your viewers into potential leads and thereafter, customers. So what these AdWords extensions are and why should they be used? Let’s find out! Recognize them by initiating a Google search, for let’s say, shoes online. You will find that some ads take more space when compared to others, all thanks to the AdWords Extensions that help your ad to display more useful information, and therefore the increased length of your ad. The main idea here is to optimize your PPC campaign in order to communicate maximum information about the product or service to the viewers. 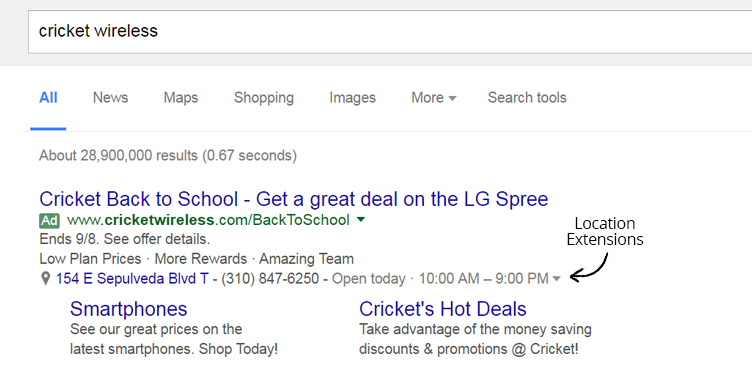 You can, of course, opt for Google ads without the extensions. But the ones with extensions have certain advantages and benefits over the other category. Why Should You Use AdWords Extensions? Do nothing without a reason! And why should you use AdWords extensions without prior knowledge of how they could be of immense help to you? We here talk about a few of the many advantages that AdWords extensions have to offer. First and foremost, adword extensions lead to better click through rates since the viewers are now exposed to more information pertaining to the product or service and also get options to get in touch with the concerned people immediately. Owing to more precise information and more ad space, the ads with extensions tend to be different from the others and garner more attention. For no additional costs, you get more valuable clicks from the viewers. What else could you ask for? In general, it has been seen that Google ads with extensions tend to provide a better and smoother experience to the viewers when it comes to navigating around the ads. Now that you are convinced of the importance of AdWords extensions, it is only natural to look for a few of them that can help you achieve the motive. Read on! Let’s review the top 6 AdWords extensions and see in detail how they can be of help to you and your campaign. A review extension, in the simplest terms, makes use of third party interference in order to have a good and unbiased review of the products and contents of your page. One of the most full-proof ways of verifying the efficiency of the content of a page is through testimonials and reviews. This ensures that the user who is going through the ad on the page has trusted the content. This brings about a sense of validity and authenticity. This is thus a must-have extension for every online marketer. However, there is one thing to be borne in mind here. It is imperative that you go through and are thorough with the guidelines of Google Review Extensions before you start adding these reviews to your site ad. Third party sites like G2 Crowd, Trust Pilot, Trust Radius and the likes could come into action here. Callout Extension is one of the most useful extensions to have if your aim is to express everything your service is about in those 2 lines of the advertisement. It gives you the chance to incorporate more words in order to communicate your message clearly. Basically, breaking it down to the simplest level, a callout is any short phrase that gives the user an idea of the service that you are offering. It would mean putting together small sentences like the main idea of the service, the number of hours, delivery time, location of stores and many more such pieces of information that might be essential for the viewer or potential customer to know in those few words. Basically, what this extension does is gives you maximum information in limited words. This particular extension basically works by adding more links to your ad that ensures that you are reaching out to the potential customer base with as much information about the service as you possibly can. When you add some essential information that surrounds the main service you offer, it increases the credibility of the ad. This also improves on the potential opportunities for the viewer to reach the sites that are most useful to them. For instance, if it is a particular educational course that you are offering to the viewers in the advertisement, then the links added could be of taking additional exams and equivalent ones. This type of an extension caters to those businesses that are revolving around many different ideas. For instance, if your business is for food, it could be encompassing a number of different food items and cuisines. When you advertise your services on the internet, you must make sure that you include all relevant points such that the viewer has access to all the information required. This is where structured snippets come into play. Thus, this will give you the option to incorporate the different facets of the service information in one single piece of advertisement. In fewer words, all the necessary details and types are included here with the help of this extension. When you place an advertisement of the service you offer online, your work doesn’t end just at providing the details regarding the service. When the readers come across this advertisement, they would want to get in touch with the concerned people. For this reason, it is necessary to include an option that allows the users to give you a call such that they can get all the required information and request for your services if need be. The Call Extension looks after this aspect of the advertisement. It incorporates the call feature that contains your phone number for orders or inquiries. According to Google records, online advertisements that have phone numbers included have a 6% to 8% higher click through rates. This extension ensures that the viewers do not have to visit the website to get the contact information since this can be done right from the advertisement. The Location extension tries to target businesses that have offices in different areas or multiple locations. In that case, you would need to pinpoint the exact location of the outlet that is going to offer the service mentioned in the advertisement. A Location extension is basically going to incorporate details like the address, phone number and business hours in order to let the users be aware of the contact details. This feature also helps filter out the customers and get the attention of the people who really want the service or the product. For instance, if your service revolves delivery of certain items around the city, if you put in the location, only the interested viewers or the potential customers will focus on the content. Also, sometimes putting the location means making the viewers realize how close the business is to them. So, once you induct these few adword extensions into your ad, you are likely to get higher conversion rates. The choice of extension basically depends on the type of business you are running. In order to get the most of the information and PPC campaign, the need of the hour is to hire a Google Adwords Professional who can narrow down your options and get the ideal adwords to promote our ad, thus, helping you feature your ad with all the relevant directions and information. This entry was posted on December 29, 2017, 5:12 am and is filed under Automotive Digital Marketing, Automotive Marketing, Automotive Websites. You can follow any responses to this entry through RSS 2.0. You can leave a response, or trackback from your own site.